INDIO - In a battle of welterweights looking for one last hoorah, bought himself another payday. 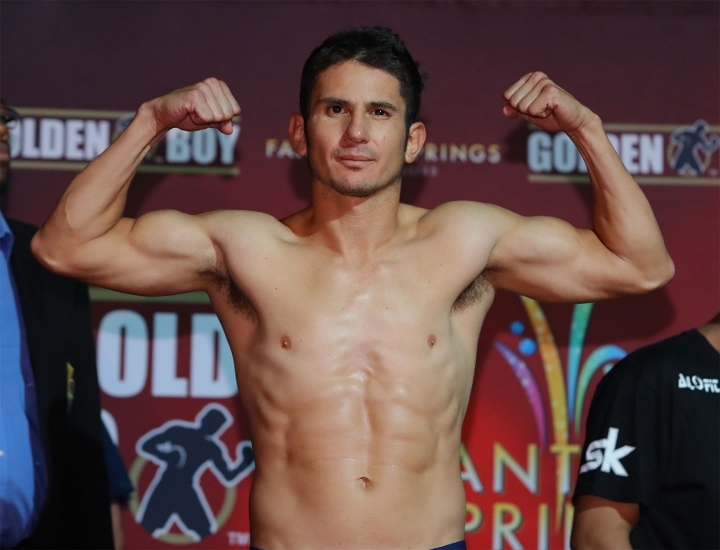 Herrera won a hard-fought 10 round majority decision over Jesus Soto-Karass before a boisterous and near-sellout crowd at the Fantasy Springs Resort Casino. With the win, Herrera improves to 24-7, with 7 KOs. Soto-Karass drops to 28-12-4, with 18 KOs. As both fighters are now on the downside of their career, Herrera and Soto-Karass have struggled in recent fights. Soto-Karass entered the fight winless in his previous four bouts, while Herrera had lost two of his previous three bouts. Herrera was the busier and more-effective fighter during the first three rounds, winning those rounds by outboxing Soto-Karass. During the middle rounds, Soto-Karass closed the distance between the two fighters, attacking the body of Herrera. Both fighters had their moments during the final rounds of the fight. As Soto-Karass walked Herrera down, he threw more punches, while Herrera was more precise with his punches. With the fight as close as it was, both fighters laid it out on the line in the 10th round, throwing and connecting as the crowd stood in excitement until the final bell sounded. One judge scored the bout 95-95, while the other two judges scored the bout 96-94 for Herrera. Light heavyweight Vyacheslav Shabranskyy stopped previously-unbeaten Todd Unthank-May after the seventh round. Shabranskyy (19-1, with 16 KOs) broke down Unthank-May throughout the fight, consistently landing overhand right hands to the head. Unthank-May (10-1-1, with 4 KOs) was at his best when he threw and landedjabs to the head of Shabranskyy, but would get beat to the punch when Shabranskyy initiated exchanges, again with right hands to the head. Unthank-May had to deal with a cut over his left eye in since round two and it cut progressively worse as the bout progressed. After the seventh round, Unthank-May's corner advised referee Eddie Hernandez to stop the fight. In a swing bout, super middleweight Niko Valdes won a six round unanimous decision over Jaime Solorio (7-4-2, with 5 KOs). Scores were 59-55, 59-55, and 60-54 for Valdes, who improves to 6-0, with 5 KOs. Junior bantamweight Ricardo Sandoval won a six round unanimous decision over veteran Antonio Rodriguez (8-18-1, with 5 KOs). Sandoval switched from conventional and southpaw stances during the fight, landing the more-telling blows over the slower and taller Rodriguez. Scores were 60-54, 60-54, and 59-55 for Sandoval, who improves to 8-1, with 7 KOs. Junior welterweight Jonathan Navarro (11-0, with 6 KOs) won a hard-fought eight round unanimous decision over Angel Sarinana. Navarro, who is trained by Robert Garcia, scored a flash knockdown of Sarinana at the end of round one. Undaunted, Sarinana (7-7-2, with 3 KOs) was able to counter in the pocket, but Navarro landed at a higher connect rate throughout the fight. Scores were 80-71, 80-71, and 79-72 for Navarro. In the opening bout of the Golden Boy Promotions card, junior middleweight prospect Marvin Cabrera (5-0, with 4 KOs) won a six round unanimous decision over veteran Esau Herrera (19-9-1, with 10 KOs). Cabrera was the more-polished of the two fighters, landing the more-telling blows throughout the fight. Scores were 59-55, 59-55, and 60-54 for Cabrera. [QUOTE=BrometheusBob. ;17923137]Awh shiet, I missed it. How did Herrera look? He still look shot? [/QUOTE] Same as always; Underwhelming. He's crap, to be honest, always has been. I scored it a draw. Awh shiet, I missed it. How did Herrera look? He still look shot? Golden Boy has a lot of options for Herrera now that he won, but Karass deserves another fight what about Pablo Cesar Cano? That's a fun fight. I had Jesus winning by 2 points. Bad decision IMO.